I'm not much of a frankener, but I lately I've been in the mood. Since I crave lavenders and purples, I had to make a purple franken. I recently got China Glaze Electric Lilac, and was disappointed with the sheerness of it, so I decided to make the "Electric Lilac" I really wanted. I named it Pixie Dust, as this color makes me think of unicorns,fairies, and all those happy sparkly things! Pixie Dust is a bright lavender with iridescent sparkles and flakies. On side note I'm very excited for today. I get to see my best friend. I haven't seen her in 3 years. 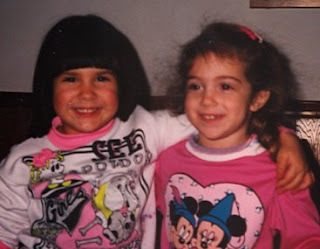 I know "best friends" after a certain age is silly, but we've been best buddies since we were 2. After high school we we went separate ways as of location, but no matter how long we don't talk or don't see each other, nothing changes. She's about to start her 4th and final year of vet school, and I'm very proud of her. She's wanted to be a veterinarian ever since she was probably 2. She'll only be here until Monday morning, but I'll take anytime I can get. She's not a nail polish junkie, but she does like OPI pinks on her toes. Maybe I can convert her in 36 hours? Here is a pic of us when were little. I'm not sure how old we were here. I got the WORST haircuts as a kid. Don't you love the chili bowl hair cut? I had bone straight jet black hair. I was so tan then too, now I'm so pale! I love the colour and the iridescent sparkles, very nice. Very pretty! And I seem to remember having a similar haircut as a child...haha. I love purples. I have been spying Color Club Pucci-licious. Have a great time with your BFF. My BFF can go weeks without talking and months without seeing each other but not matter what, we pick up right where we left off. That is a sign of true friends. Again, have fun. Take her to Ulta. LOL!!! I introduced my BFF to Ulta and now whenever she goes, she blames me for the damage. LOL!!! Have fun with your best friend!! It's so pretty! I love the sparkles and the name is perfect. My sister and I wore pixie hair cuts as kids. My mom had her way with the scissors!! Perfect name! This is so pretty I love the glitter in it and its perfect on your skin. Love the franken, it so pretty. the name is so fitting. I'm seriously in love with that color! You have been doing some amazing things with purples lately! Love it. OMG such beautiful heavy hair.